Welcome to Strike-A-Light - the new futuristic computer game essential for all ages. Combining the skills of Chess and Othello, we are confident you will enjoy learning the strategy and tactics of this game. In this free trial version, you can play against the computer on nine difficulty levels and on two board sizes - 4x4 and 5x5. The 4x4 board plays a simple game that is ideal for children and a great starting point to discover the basic game play. The 5x5 board begins to offer a more challenging match and gives you a taste of how quickly the strategic depth increases with each new board size. The official competition board size for two players is an 8x8 board, and for four players is a 10x10 board. All board sizes from 4x4 up to 16x16 are available in the retail version of Strike-A-Light Challenge. 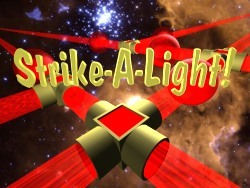 So start activating your Lasers now and enter the challenging world of Strike-A-Light!